With the rise in popularity of the smoking slipper, I have sat and ahhhhed and oooohhhhhhed over various offerings from designers: Miu Miu’s velvet and crystal offerings were considered, as were Christian Louboutin with the crazy fun plaid and studs, but these Valentinos just wouldn’t get out of my head. And so, my first shoes of 2013 were purchased. 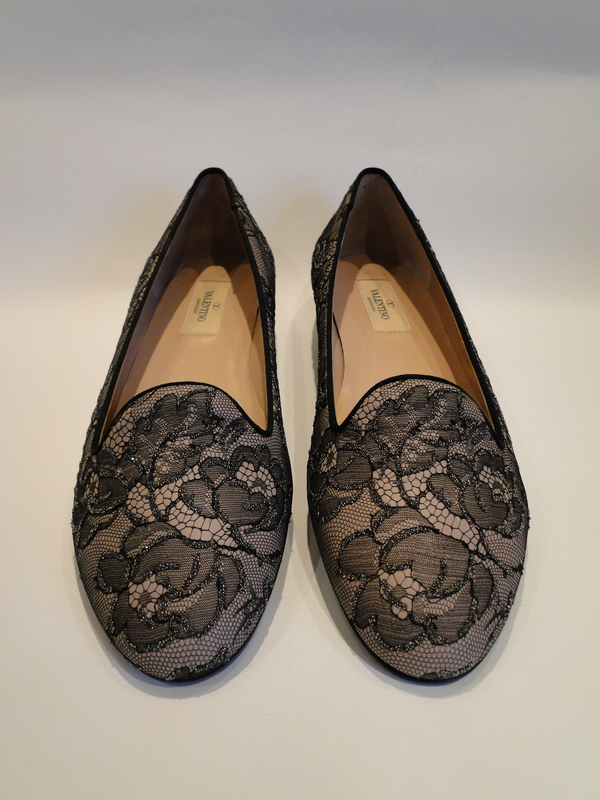 Despite looking like a dainty slipper, they are surpringly solid – leather under lace, sprinkled with teeny-tiny black caviar sparkles which glint in the light. They feel supremely grown-up, and are a change from my wardrobe of ballerinas. Low-key, with no discernible logos, I can’t wait to wear these with J.Crew Minnie pants and a black cashmere sweater. We have just booked up Spring Break – so they will remain in tissue until then, where I will skip around East Hampton with my lady-shoes on.